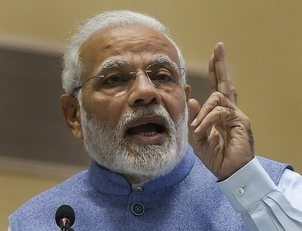 Chhatarpur (MP), Prime Minister Narendra Modi Saturday hit out at the Congress Saturday, days after its leader Raj Babbar compared the rupee’s slide with the age of his mother, saying those who did not have issues to talk about, resort to abusing someone else’s mother. Addressing a rally here, Modi, in an apparent dig at UPA chairperson Sonia Gandhi, said 125 crore people of the country were the “high-command” of his government, which was “not remote-controlled by a madam”. The Congress leader had kicked up a row in Indore Thursday when he compared the falling value of rupee against US dollar with the age of the prime minister’s mother. Attacking Gandhi, Modi alleged that “coffers of banks were emptied for the rich during the madam’s government”. “However, our government opened doors of banks for the needy youth,” Modi said. The prime minister asked why the Congress was worried about Madhya Pradesh Chief Minister Shivraj Singh Chouhan being called “mama”. “They are worried Shivraj is called mama…Why, don’t you remember (Ottavio) Quattrocchi mama and Warren Anderson (then chairman of the Union Carbide) mama,” he said, referring to the Bofors scandal and the 1984 Bhopal Gas tragedy.